Recently, in a laboratory outside Seattle, I ate a piece of buttered toast that I will remember for the rest of my life. 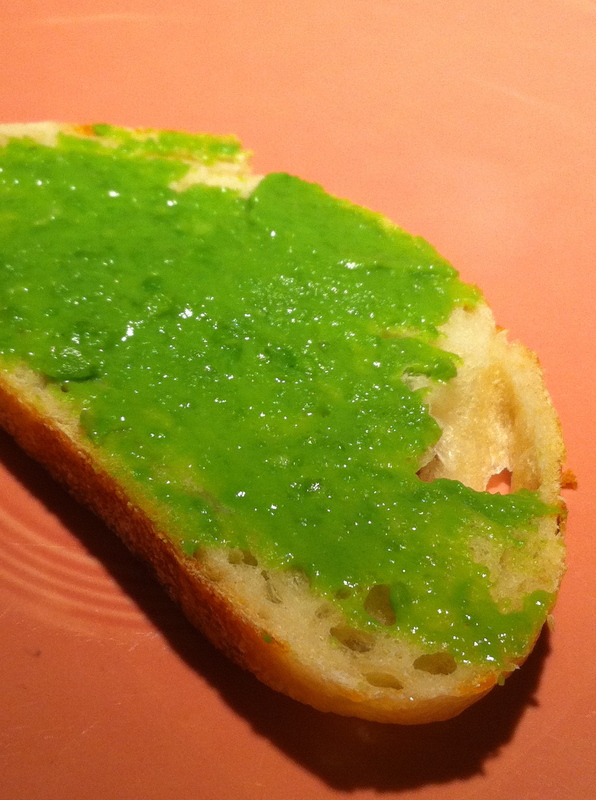 The bread itself was not extraordinary, but it was spread thickly with the brightest-green butter I’ve ever seen. It was not true butter, but rather an extract of pure green peas. 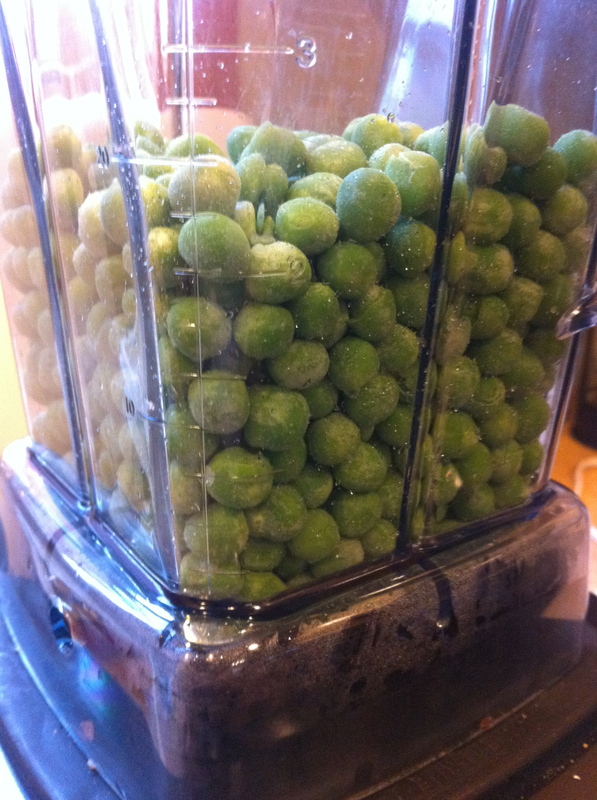 Fresh peas are blended to a puree, then spun in a centrifuge at 13 times the force of gravity. 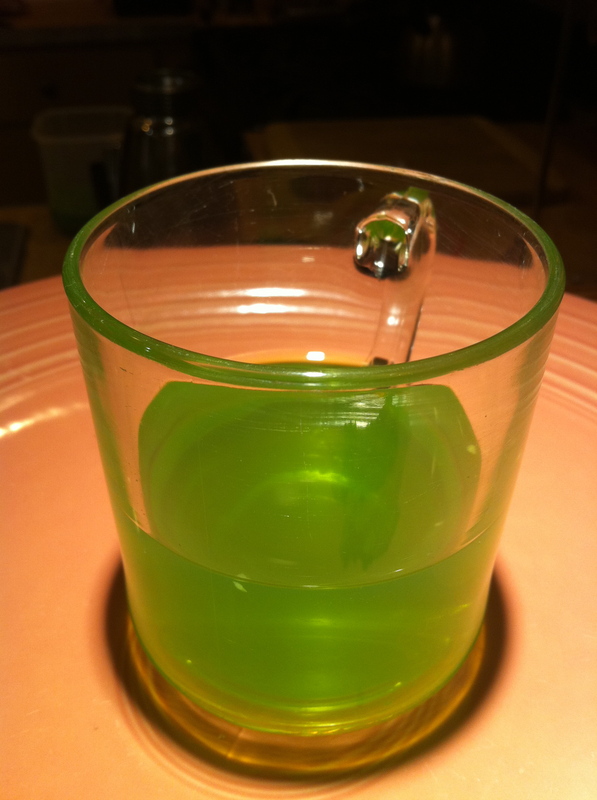 The force separates the puree into three discrete layers: on the bottom, a bland puck of starch; on the top, vibrant-colored, seductively sweet pea juice; and separating the two, a thin layer of the pea’s natural fat, pea-green and unctuous. As the first reviews began coming out from the 30 course dinners held by the Modernist Cuisine team, everyone mentioned the pea butter in particular. 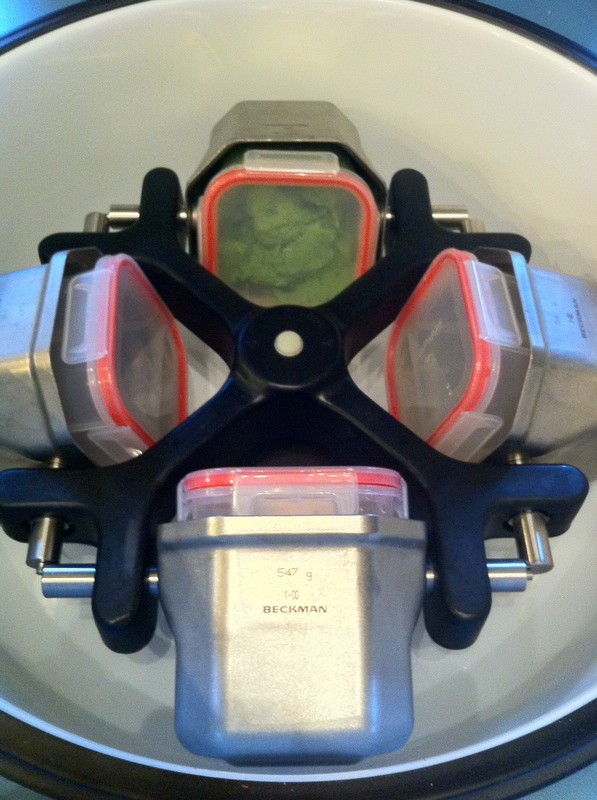 A pretty simple recipe, you take pureed peas and spin them in a centrifuge to extract the pea fat. I gave it a shot at my house, taking a can of peas, blending them, and spinning them for 30 minutes. Nothing good came of it and the layers did not seem to separate. I was stumped. That seems simple enough. So I went home and went at it. The chefs recommended a bag of high quality organic peas. My local store had Kroger brand. Well, hey, I gotta start somewhere. I brought home a bag and threw them in the Vita-Mix for their first spin of the day. 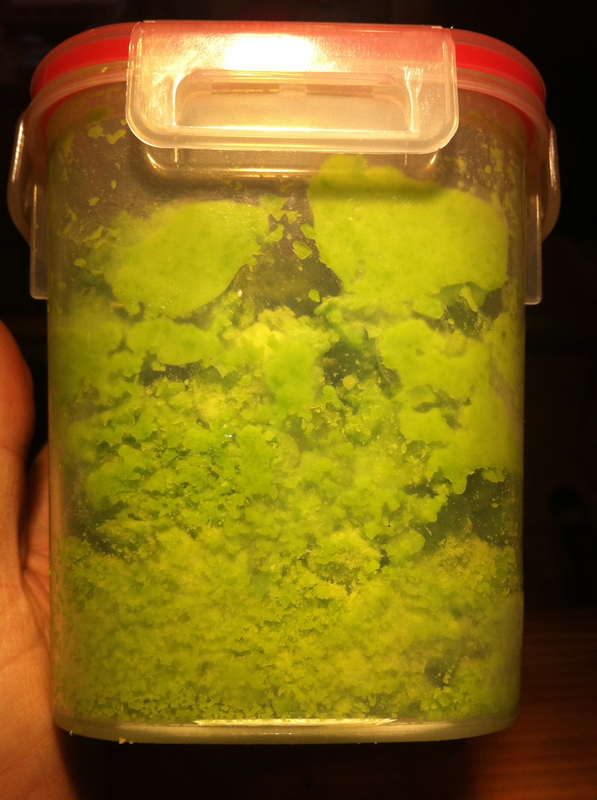 It ended up being a very bright green frozen powder. I put the pea dust into one of my centrifuge containers and filled the rest of the containers with water as counterweights. 6.58 x 90 = 592 min. 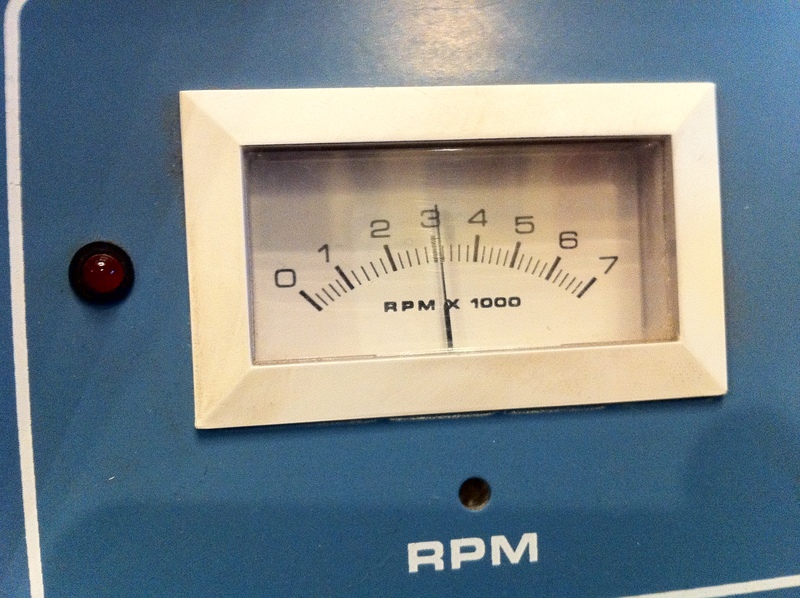 Ten hours in the centrifuge? Mm. I started around 3pm and didn’t feel like waiting until 1am to see the results. So I decided 5 hours was plenty. She also mentioned that it was good that I had a refrigeration unit attached. The reason is two fold: 1) so the food doesn’t cook; and 2) it keeps the pellet together, providing better separation. I checked my centrifuge temperature with and without the refrigeration unit. Without, the chamber got to 124F. With the unit turned on, it was at about 70F. So a significant difference to be sure. And after five hours, I pulled out the peas and saw the results. 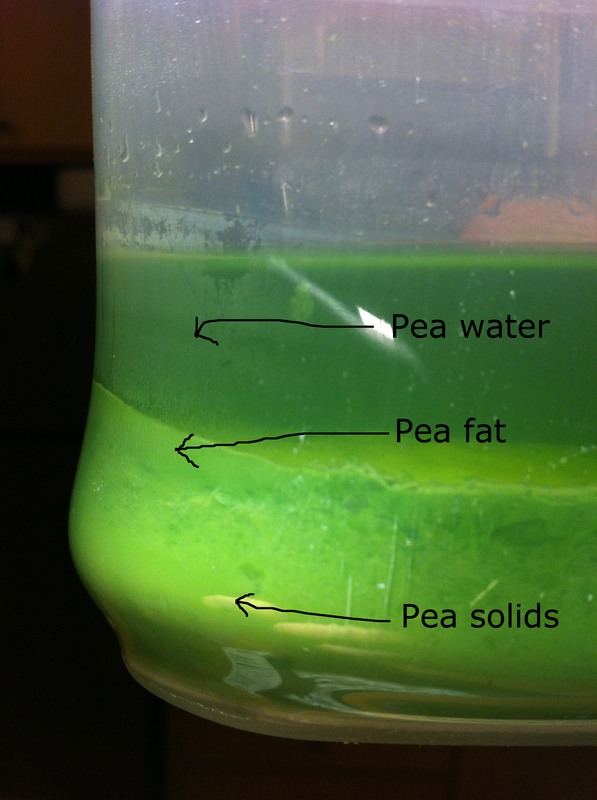 Three separate layers: a pellet of pea meat, a thin layer of pea fat and a supernate of pea water. One thing to note is look at the bottom of the container as compared to the photo of it prior to spinning. Five hours in the centrifuge completely distended and reshaped it. Luckily, it didn’t crack open. I scraped off the fat and put it on a piece of bread. Pure bright pea flavor. It’s really, really good. The pea pellet and pea water were also striking in their own way as well. I’m a little concerned about the wear and tear on the centrifuge since I will be needing to be spinning it for long periods of time to get their results, but it performed great for a five hour run. Cooking of all types teaches you patience, and in this case as in others, the wait is well worth it. Just look at that bright green peaness! love this. Also intrigued w the pea liquid. What will you do w it? Make a gel? pea cubes, or as a broth to a gorgeous spring soup…hmm…the possibilities. The puck I’m using for a soup base and the pea water I mixed with carrot juice just to try it out. I have a few ideas rummaging around in my head…! To reduce wear and tear on the centrifuge, ensure that it is completely balanced (same mass in each chamber). also keep up with routine maintenance. ie. keep it clean, well oiled. Thanks for the tips. It shuts down if it’s unbalanced, so no worries there. My company web filter is blocking the peaness! Love the colour..! Is there anyway of making this without a centrifuge machine? I don’t think so. I can’t think how else to extract that component of the pea without the density separation provided by the centrifuge. I just bought the same Beckman TJ-6 model centrifuge off of craigslist. Did you ever find a bottle or container that fits the buckets and doesn’t deform under pressure? No, but the containers work fine. I haven’t had any break. Have fun! Great! How many times are you using each container? If it’s one-time use, that could get expensive fast. I assume it tapers towards the bottom, because the dimensions on the site say 4.25″, but the width of the bucket is only 4″. Yes, those are the ones. No, I’ve used them several times. Only one has been replaced, and that’s just because one of the tabs broke off from repeated usage. I recommend them. If you find something else, though, let me know! I was wondering if you have any recommendations on what I should do with the pea solids? 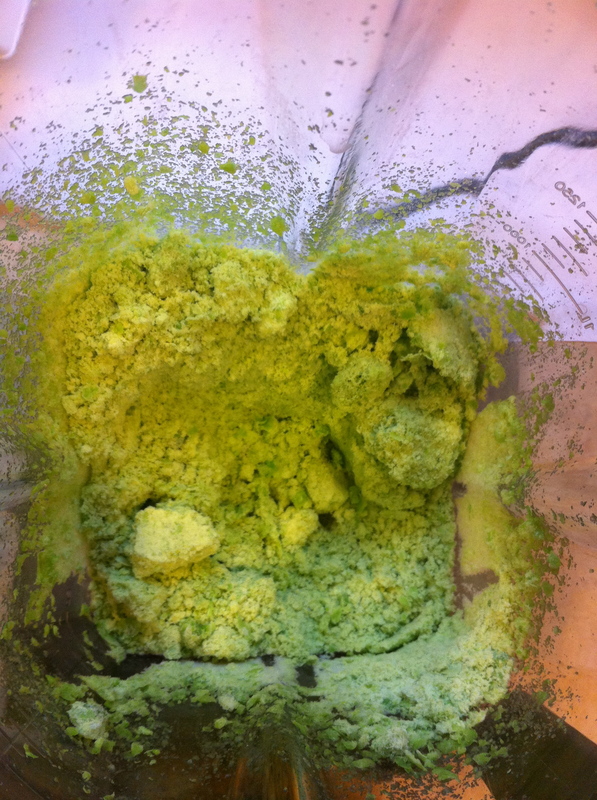 I can drink the pea juice and put pea butter on bread… but there is a lot of pea solids and I haven’t found any site or book that says what to do with those. 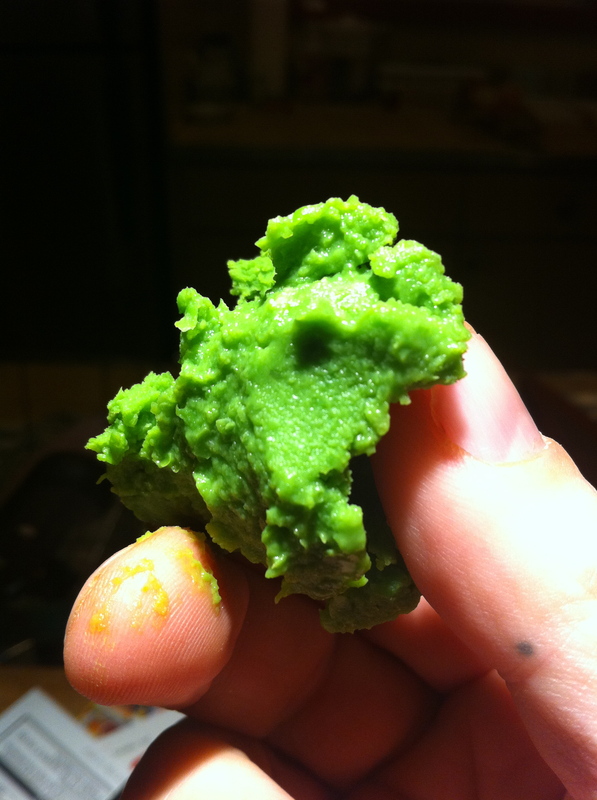 is there a place to just buy pea butter…?